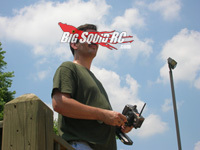 ASK Cub Reporter- 04.21.2011- Your Questions, My Barely Legitimate Answers « Big Squid RC – RC Car and Truck News, Reviews, Videos, and More! Are we running the stock motor? Yes, we are running the stock brushed motor that came on our Losi Micro SCT. Will a Mamba 25 work with the stock motor and Lipo? Yes to both. The Mamba is capable of running brushed and brushless motors, and it has adjustable low voltage cut-off for Lithium batteries. The stock Losi brushed motor really wakes up with the Mamba on 2S Lipo, mucho grande better power that’s about perfect for a drive area of 15′ x 15′. If you are looking at running in a larger area you may want to consider a brushless motor as it will give you more power and top speed. Btw…. the hot rumor of late is that Castle is seriously looking into the micro scene. How awesome would it be to see a little Mamba 10 and one of their 4 pole motors built specifically for the micro crowd? Losi Micro SCT + Mamba 10 + Neu/Castle motor + 4S = Utter Insanity! Let’s hope they start making product for the micro scene! Lastly- your Novak Spy and Tactic should fine together on the stock brushed motor, but the Spy doesn’t come with a built in LVC. You’ll have to run one of Novaks #5470 (for 2S) Smart-Stop Modules to prevent over discharging a Lipo on the Spy. What kind of runtime can I expect out of a nitro pede? What kind of gas should I run in it? I’ll give you the only first hand info I know about Nitro Stampdes, info directly from what I’ve seen at the track. Most Traxxas Nitro Stampedes seem to take about 30 minutes to start and they end up running for roughly the amount of time it takes for you to get up on the drivers stand before they flame out. Nothing against Traxxas here, as that seems to be about the average for every nitro you see at bash day at the track. As for what type of gas you should run…. I’d just fill the tank with sand (and cylinder, and fuel lines), but that’s just me. Ever consider the Electric Stampede? Or better yet one of Traxxas new electric Monster Jam trucks? Just say’n…. But to get serious for a moment…. nitro is due for a big comeback. I give it 2 years before they (the nitro side of the industry) come up with something really cool and the tide turns to everyone running nitro again. I really need your help. I race an Associated SC10 and I’m tired of my shocks constantly leaking. I build them very carefully and use green slime yet they still leak. Suggestions? Cubby– I hear where you are coming from Bill, I’ve built a lot of AE shocks in my time as well. So you’ve built yours carefully, and used Associated “green slime” on the seals yet they still leak. How about going a different route? I’ve been running the Pro-Line SC PowerStroke shocks on my Blitz for several months, they work great, look insanely good, and more importantly- they have yet to leak! If you’ve got a bit of extra cash around order a set of PL SC shocks (PL #6063-00 front, and #6063-01 for the rears, about $100 for the entire set) and the Universal Mounting Kit (PL #6063-05 about $9). The PL shocks are so trick, and I swear they are worth every penny not having to worry about them leaking. That’s it for this week, shoot us your questions, comments, rants or whatever you feel like to Cubby at BigSquidRC dot com!